Extend Your Garden's Hospitality -- Go Wildlife-Friendly! This is the first part of a two-part post. Look for Part II next week here on the blog. 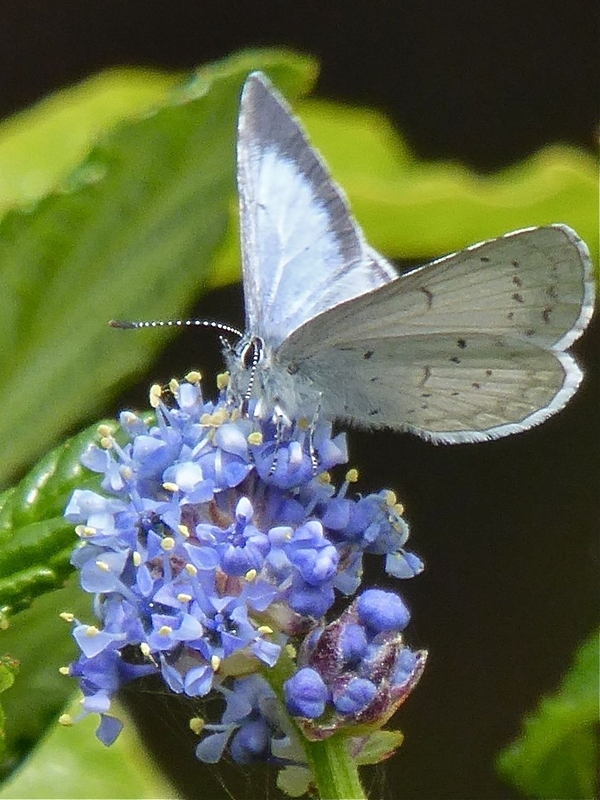 Echo Blue Butterfly, feeding on Ceanothus, one of its host plants. Photo: © Carol Nickbarg. Welcoming seasonal birds, dragonflies or other favorite wildlife to your garden can be a gratifying experience and a wonderful way to support the ecological health of your garden and community. Yet evidence is growing that our gardens can also be indispensable resources for wildlife, providing critical habitat to offset some of the losses caused by fragmentation of our wildlands. Although garden and wildland spaces are often separated by distance, they are not sealed off from each other. Garden and wildland remain connected by the movements of wildlife seeking food, shelter or nesting sites. Going “wildlife-friendly” improves continuity between separated spaces, fostering stability and variety of the habitats wildlife needs to thrive. Habitat, habitat, and more habitat. For the garden, our notion of “wildlife” shifts from larger animals, such as foxes, bobcats, deer, to the other end of the size spectrum: tiny but exponentially more numerous creatures like soil bacteria, insects and spiders, plus reptiles, amphibians, birds and small mammals. A complete garden make-over is not at all necessary to be wildlife-friendly. Wise selection and placement of native plants and physical features (e.g., shelters, perches) can create habitat, and work together with your existing garden to add depth and breadth to your garden's ecosystem. 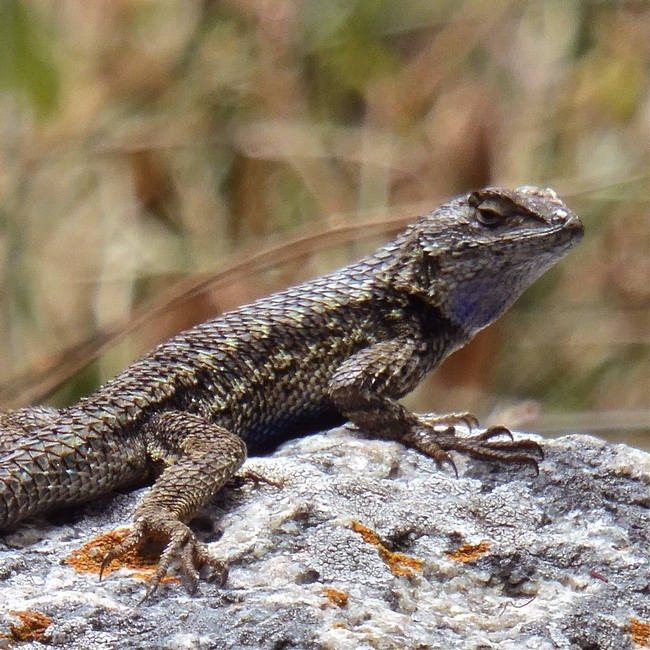 The Western Fence Lizard feeds on insects and spiders and is itself food for birds and snakes. Photo: © Carol Nickbarg. Insects and plants co-evolved over long periods of time, adapting in tandem to each other and to their shared environment. About ninety percent of insect species are specialists, drawn only to specific plant(s) for food or other needs. 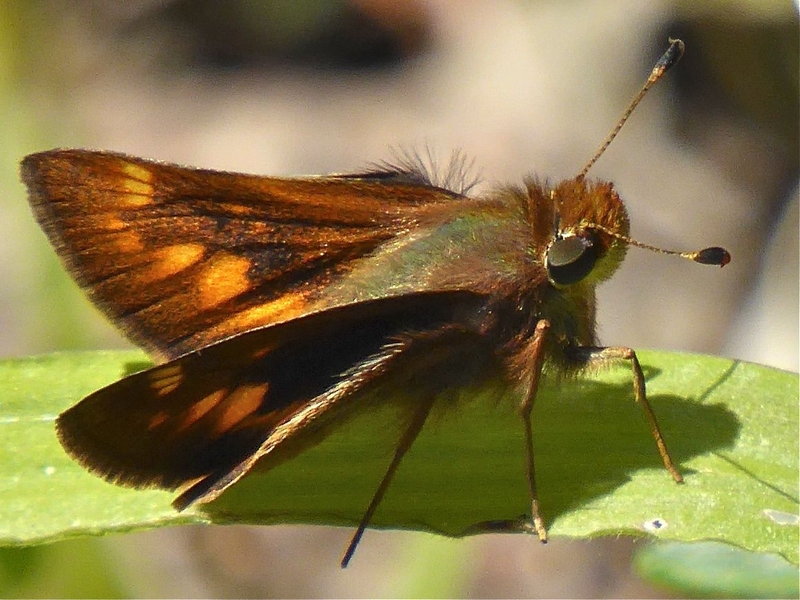 These insect-plant associations are critical, especially for insects that undergo metamorphosis and use different plants at different life stages, e.g., larval vs. adult. For the 10% of insect species that are generalists, those insects have evolved special adaptations that allow them to use a wide variety of plants. Across plant species, not all leaves are created equal. Each species' leaves contain a unique set of chemical compounds which can attract one insect species but not another. The specific set of leaf compounds present determines 1) if native insects can find and recognize the plant, and 2) if the insect can use the plant for food or reproduction. For some wildlife species, a closely-related plant, whether native or non-native, may be a suitable alternative if the host plant is not available. Our gardens are ecosystems. A healthy, sustainable ecosystem contains a diversity of plants and wildlife to meet the needs of its many inhabitants. For example, adult birds often favor berry-producing plants until reproduction, when they shift their diet to insects to obtain the protein they need for themselves and their young. 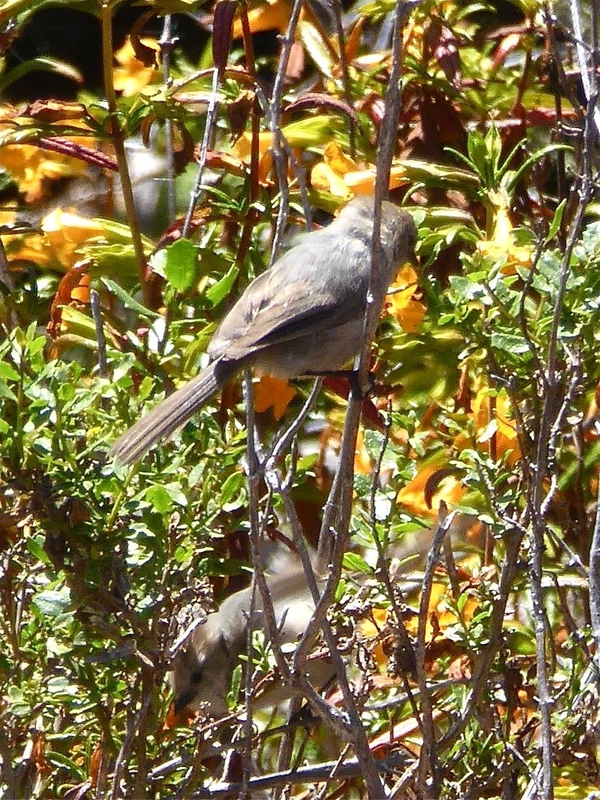 However, many berry plants often do not host insect life when birds make this dietary shift. A single plant species, even if native, cannot necessarily support all life stages or habitat needs of the wildlife that use it. 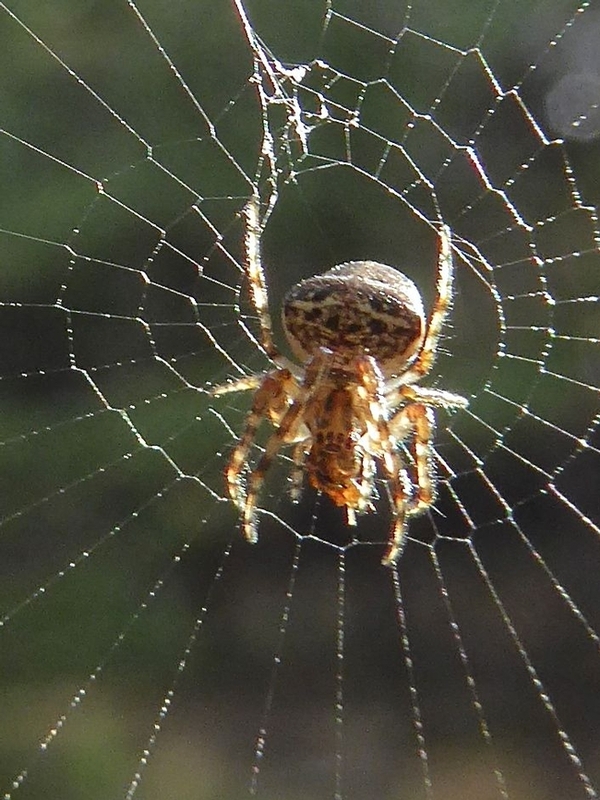 The Orbweaver Spider consumes its web and captured prey daily, rebuilding its web the next day. Photo: © Carol Nickbarg. A successful wildlife-friendly garden not only supports a diversity of animal species, but also these species' present and future generations. In return, wildlife sustains the health of its plant hosts through improved soil health, natural pest control and pollination. 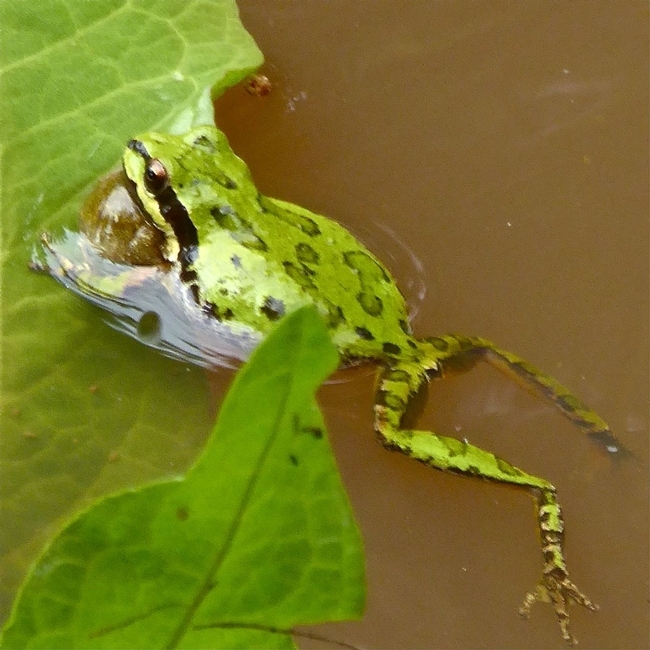 Ongoing interactions between plant and animal life can reduce or eliminate the use of chemical fertilizers, pesticides and other harmful manipulations to a garden's ecosystem, protecting local watersheds and conserving natural resources. Programs from the organizations listed below provide guidance and how-to's for integrating wildlife habitat into gardens. These programs can also spread the word in your community by certifying, and honoring with a public sign, gardens that meet criteria for being wildlife-friendly. Although these certification programs differ somewhat in their criteria, they all offer best practices that can help you, and inspire your community, whether your garden is an apartment balcony, or a generous front or back yard. For local inspiration, be sure to attend our 2017 UC Master Gardeners of Monterey Bay Garden Tour on September 9th, 2017. More information about the Garden Tour is here. 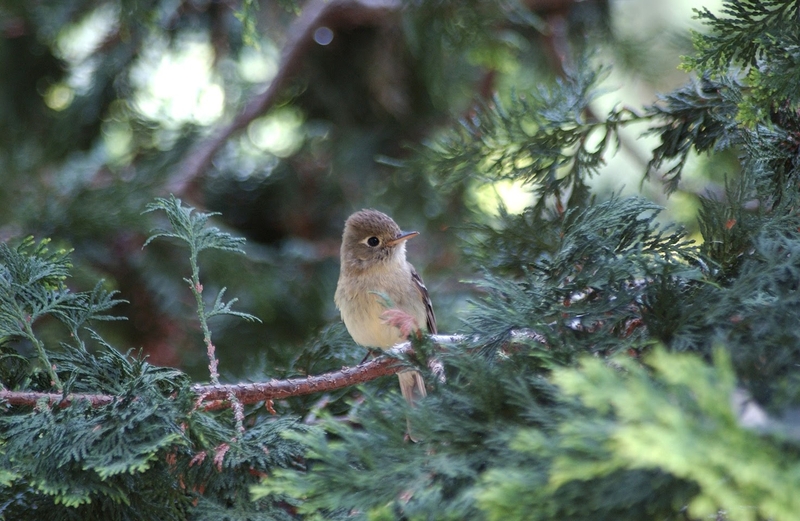 Western Flycatcher. Photo by Leora Worthington. 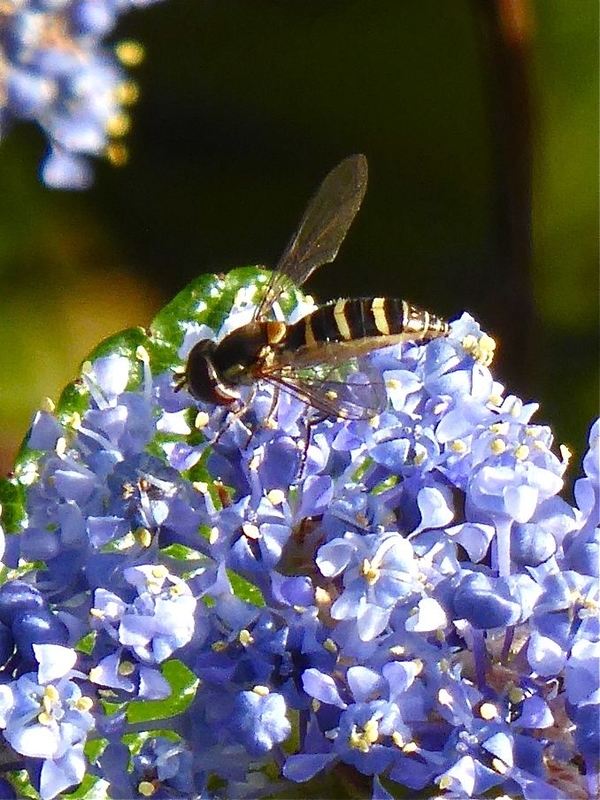 A Garden Guide To Beneficial Insects. Richard Merrill. Bringing Nature Home: How You Can Sustain Wildlife with Native Plants, Updated and Expanded. 2009. Douglas W. Tallamy, Rick Darke (Foreword). Timber Press. Ecology for Gardeners. 2004. Steven B. Carroll and Steven D. Salt,Erroll D. Hooper Jr. (Drawings). Timber Press. The California Wildlife Habitat Garden: How to Attract Bees, Butterflies, Birds, and Other Animals. 2012. Nancy Bauer. University of California Press. 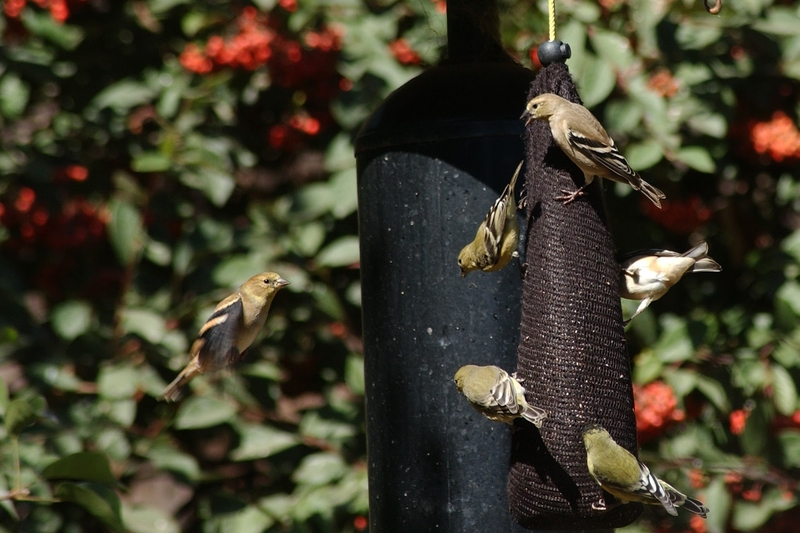 Goldfinches at a feeder. Photo by Leora Worthington. 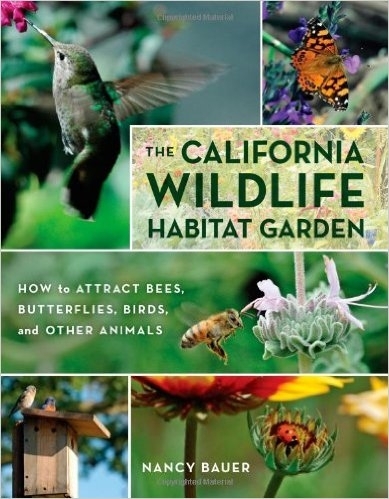 The California Wildlife Habitat Garden: How to Attract Bees, Butterflies, Birds, and Other Animals by Nancy Bauer. University of California Press, published in 2012, 232 pp. The California WIldlife Habitat Garden book cover. I stumbled across this book in the Mono Lake Committee Information Center & Bookstore in Lee Vining, CA while visiting Mono Lake this summer. I'm committed to creating native plant and animal habitat on my 1 acre plot in Prunedale and I'm always on the lookout for books that help not only with plant selection, but habitat creation. While planting native California plants is a good move for their drought tolerance, adaptation to local climate, and low maintenance qualities, to create habitat that functions well as a place for refuge, foraging, and reproduction, an ecosystem approach provides the largest return on gardening investment. This book is laid out in 5 chapters. First is a discussion of what constitutes a wildlife garden, with a garden profile of a Walnut Creek garden that illustrates the main principles (providing food, shelter, and water). The following 4 chapters each focus on different types of habitat gardens, including bird habitats, pollinator gardens, wildlife ponds, and front yard habitats, each with garden profiles and discussions of challenges and solutions the homeowners developed for their particular properties. Appendices include guidelines for wildlife gardens, native plant communities, uses of hedgerows, common California butterflies and host plants, and invasive pest plants, among other topics. The book has several features that I really valued. First, there are lots of photographs. While I like the photographs as eye candy, I also like to see how different plants are layered to create a more complex habitat. That's probably my own biggest challenge as a new habitat gardener - figuring out how to create layers of different heights of plants to give visual depth and provide lots of places for birds and small animals to shelter. Second, I like that the properties featured are different sizes, from several acres to less than 1/4 acre. Not all habitat gardens have to be vast expanses of expensive property. There is real value in creating small but rich habitats that create connectivity across larger landscapes. Third, I like that each chapter focuses on a different type of habitat garden. Whether a reader's particular interest is butterflies or birds or even dragonflies, there's a discussion that will be helpful in creating or enhancing habitat. Finally, many of the featured gardens have been created over time. I'm as much a victim of instant gardening gratification as the next person, but it's comforting to see that a wonderful habitat can develop even one plant at a time, since sometimes one plant is all I can afford. One subject did give me pause, probably because I tend to be a habitat purist. This book talks about the use of non-invasive non-native plants in the habitat garden. But being a purist is not always realistic or helpful. Blooming ornamentals can be a supplement to native plants to provide nectar and pollen for honeybees, other pollinators and beneficial insects. Seeds of composites such as sunflowers, zinnias, and coreopsis can provide food in the fall for juncos, finches, and other seed-eating birds. Flowers of many medicinal and culinary herbs are excellent nectar sources for all types of pollinators. And the more I thought about the use of non-native plants to supplement and extend the value of a native habitat garden, the more I could feel myself softening. I still believe that a garden composed of mostly native plants will provide the most beneficial habitat for wildlife, but this book convinced me that there can be value in carefully chosen ornamental plants as well. And that, dear readers, was a very valuable lesson about keeping an open mind, one that I hope I'll remember in the future.